FCI # 162, Origin: Great Britain, Group 10.3 Sighthounds. Grooming: Low, Shedding: Medium, Coat: Short and smooth. Color: Any color is allowed. Ease of training: Medium, Energy level: Medium, Span of life: 12-14 years. Breed: While the ancient origins of the other kinds of the scenthounds is generally brought to the consensus, regarding Whippet there is still an argument.? ?There are two irreconcilable theories.? ?According to the first, which relies on the multiple images related to the XVII century, Whippet, although he did not have such a name at that time, already existed as an ancient breed, and it is quite erroneously to believe that this hound of a medium size appeared only in the last century. The opposite version says that Whippet actually appeared in about 1830-1850 by crossing Greyhounds with a variety of terriers (it is not exactly known what kind of terriers were used).? ?Such crosses allowed the miners from the north of England to get a very fast dog of a medium size - ? ?which makes this dog a lot easier and cheaper to maintain, than a Greyhound - mobile, clever and playful, fully adapted to the chasing of rabbits, which was organized by the poor people in these areas very often. The supporters of this theory say that ? ?for the breeding of ? ?Whippets there were used the smallest Greyhounds to within a few generations achieve a significant decrease in the growth of dogs (at least up to 50 cm).? ?On the other hand, the qualities, borrowed from the terriers - strength, vitality, dynamism - were precisely those which were required for coursing the game and later - at the dog races. The? ?Greyhound was partially lacking these qualities, so by some people he was considered less rapid. It is unlikely, that there were made any crosses with the Piccolo Levriero Italiano (Italian Greyhond), because in those days in England they were very few, and they were almost not met in the northern areas. If we will think better, we will be able to discover, that this two? ?theories are not so??irreconcilable.? ?The fact is that for centuries there was a scenthound of a medium size ("a small greyhound"), representing a very close similarity to the modern Whippet, but such a scenthounds maybe were not many, that does not exclude the possibility of interbreeding of the Greyhounds with the dogs of similar qualities.? ?It should also be noted that the interbreedings were were practiced in the twentieth century as well.? ?For example, there was a Whippet with the harsh coat, although his standard was never written.? ?Speaking about the origin of Whippet, it may be noted that the dogs, depicted on the old paintings are looking more like the modern Whippets than those that were called a Whippet just a century ago. As with all British standards, the standard of a Whippet is describing mostly the main characteristics of the breed, without going into the small details, like - for example - in the standard of the Italian Greyhound.? ?Not everyone can accept this concept of a standard, many breeders believe that the standard should give a full and detailed description of the "ideal type".? ?However, the British Standard of the Whippet is reflecting the quality of the breed.? ?Indeed, if there is a breed that can not be estimated from the individual separated points, but must be evaluated in general, it is Whippet.? ?For this scenthound harmony and balance are the most important, without this two things the Whippet does not exist, even if the dog has some individual qualities??excellent. The paramount importance of a balance, as it is indicated in the first sentence of the standard, is necessary to strike a balance between two contradictory requirements: the power should be combined with the elegance and the strength - with grace.? ?Too strong dog will look massive and will lose the elegance, while too subtle Whippet will certainly be fascinating, but extremely fragile and with the lack of a certain athleticism. This standard since 1903, when it was issued, over the century has not changed much (this breed was recognized by the Kennel Club of Great Britain in 1890).? ?The main thing is that can be noted from the requirement: the Whippet ? ?should be "a Greyhound in miniature". The first champion of the breed - Zuber - was born in 1889.? ?He had undoubtedly the great influence on the breed, as the pedigrees of most of the good Whippets necessarily have this name.? ?The first famous kennels in the UK were "Shirley" and "Manorley".Then, after the First World War, "Watford" and "Willes" also became well-known. General Features: Whippet is a small English scent hound - medium sized smooth-haired dog, which occupies a middle position between the Greyhound and the Piccolo Levriero Italiano. The overall balance and harmony of composition, developed musculature in conjunction with the sturdy, strong legs just make it clear that this dog is designed to run fast. By his nature the Whippet is a perfect companion, incredibly dedicated to his owner. This dog can cope perfectly with the roles of a passionate hunter, the races winner and the true star of a dog shows. 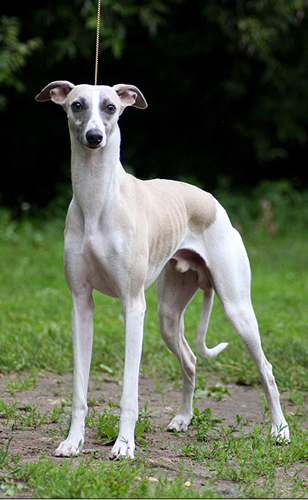 Whippet has a short smooth coat, that comes in different colors (by the standard any color is allowed). Temperament: The elegant Whippet suffers from preconceptions, often contradictory. In fact, he is perfectly adapted to the modern life.? ?Many people believe that if Whippet is a sport dog, he needs a lot of intensive exercises.? ?On the other hand, his grace and elegance suggest that this dog is fragile, with the poor health ...? ?Both are wrong.? ?In fact, Whippet is a combination of strength and elegance.? ?Although this dog was hunting in the past, and now -especially in the Western Europe - is designed to participate in the races, he does not require much longer walks than any other breed of the same size.? ?Of course, for Whippet races are very important, and he willingly enjoys the moments of freedom, but to keep him in a good shape, the daily grueling training is not so??necessary. Regarding the health of a Whippet - this breed is quite strong.? ?Whippets may need a veterinarian attention mainly in those cases when they are released unleashed and ? ?free in the countryside or in some dangerous areas.? ?Most often, the reasons for treatment are - fractures, detached claw, sprains, ligament rupture, and even a dislocated shoulder.? ?Whippet should be kept on the leash in the unfamiliar terrain. Due to the fact that the Whippet has a short coat, the special care is not required.? ?It is periodically necessary to clean him with the rubber gloves to remove the dead hairs, which makes Whippet's coat to look shiny and silky. Whippet's claws should be regularly cut off, because the long claws in such a fast dog, as Whippet may cause injury. 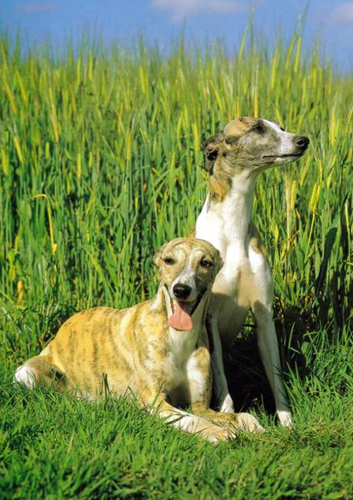 In general the scenthounds are somewhat reticent, reluctant to vigorously express their feelings, kept aloof with strangers, but most of this qualities are not common in Whippets or at least are expressed less. Among all scenthounds, the? ?Whippet, without a doubt, has the most affectionate character, he remains faithful to his master and he does not show too much of his affection to the strangers.? ?He loves the company of children, his attitude for them is patient and friendly. If you have several Whippets living in the same house, they will never argue because of the warm and cozy places, because they love to curl up against each other. It is quite often that the? ?breeder would keep at the same time a good dozen of Whippets - adults and puppies, females and males, which are comforting on the same couch, presenting a cute mixture of paws, heads, tales and bodies!? ?This "feature" of the Whippet is convenient because in the house one dog takes the same space as two or even three.? ?In addition, the Whippets almost do not bark, the presence of several dogs normally does not cause any troubles to the neighbors. Regarding the character of a Whippet, one can say that this dogs are very sensitive: this dog immediately responds to the mood of the owner and tolerates no screams and disputes in a raised voice.? ?Obedience is not the strength of a Whippet, but if he wants, he will listen and obey.? ?Educating of a Whippet can only be with kindness and patience, but not by a demonstration of power and shouting.? ?To express his "unhappiness" with the Whippet, the owner only needs a??strict??tone.? ?By following these guidelines, you can raise up your Whippet obedient enough.? ?Only beware, that in the field, if he saw a rabbit or a hare, the Whippet may go out of obedience, but he always returns to the owner as soon as he will lose the sight of the quarry. Health problems: Generally Whippet is a very healthy breed. Still some Whippets may be prone to the skin allergies. Also in some lines there may be some eye issues.